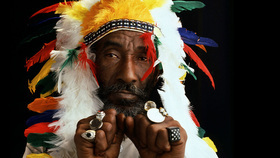 Lee Perry launched his career in the 1950´s at Jamaica´s famed Studio One where he recorded over 30 ska records for studio boss Coxosone Dodd. A brief period followed working for Joe Gibbs Amalgamated label, before unleashing his own Upsetter label in 1968. From the very first release his unique approach to the studio shone through with the sampling of a baby crying on the massive selling People Funny Boy. Through to 1972 he not only worked with his inhouse band The Upsetters, writing and producing many hits including Return of the Django and Live Injection, but also found success producing The Wailers; Mr.Brown, Soul Rebels, Duppy Conqueror, Don´t Rock My Boat, Sun Is Shining and many more. In 1973 Perry built the Black Ark studio in his back yard and went onto produce arguably the most innovative albums not only of his career but also in the world of reggae, including the trinity of Junior Murvin´s Police and Thieves, The Congos - Heart of the Congos and Max Romeo´s War Inna Babylon albums. In 1978 Perry burned the studio to the ground. In more recent times the Grammy award winning Perry has been listed in Rolling Stone magazine´s Top 100 artists of all time, collaborated with Mad Professor, Beastie Boys, Adrian Sherwood, The Orb, and released dozens of albums in his own right.